Celeste Ng's new book is marvelous. The way her characters and their storylines intersect and overlap is beautifully executed, and her ability to convey the points of view of these very different characters is so impressive. If you were a teen in the late 90s like I was, you'll probably get an extra kick out of this novel. The ending wrapped up a little too cleanly for me, but I'm not sure how else I'd have liked the story to conclude, so that's a minor criticism. I think you'll love Little Fires Everywhere. 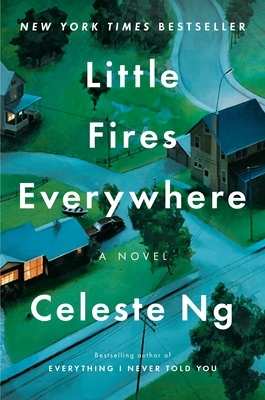 Celeste Ng develops characters that you immediately fall for and the women and teenage girls in Little Fires Everywhere are fascinating. I loved the complicated family dynamics in two households in a Cleveland suburb. This is a story about two very different mothers. I picked up Little Fires Everywhere when looking for something to read. I had no expectations, and was overwhelmed by how much I enjoyed this book. About the secrets we keep and how they motivate us to do the things we do, centers around an afluent suburbian Detroit family, a single mother and her daughter. Each character has secrets and tries to find answers to thier questions without revealing things to each other or themselves. Good fun read.